Seriously, every time we shared a new meal plan using ingredients from Costco, I’d dream about a way where you could create your own. You could pick the recipes you wanted – and then print out the complete meal plan for those meals. Like today is THE DAY. Today is the day that the desktop freezer meal plan builder is available for you. 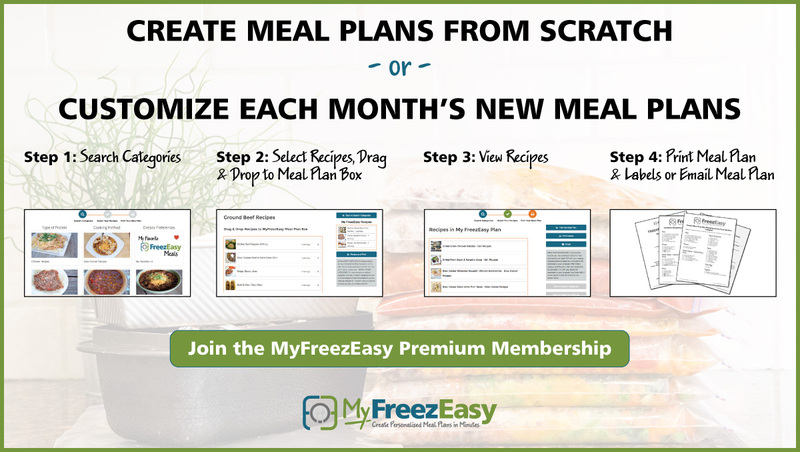 The MyFreezEasy Premium membership with access to this amazing meal plan builder tool is available. Here’s why I said MyFreezEasy is one of a kind and the dinner game-changer – with the Premium membership, you get access to an OH-SO-EASY program where you get to CREATE YOUR OWN. No more wasting a whole meal because your husband hates curries or your youngest refuses to try anything with pineapple in it – this option lets you literally HAVE IT ALL, AND HAVE IT YOUR WAY! It seriously takes just minutes. If you’re ready to go from hot mess express, running around like crazy and winding up grabbing something – anything! – just to get food on the table to calm, relaxed, and feeling GREAT about the delicious, healthful meals you prepare for your family, you’re ready for this. Let MyFreezEasy do all the meal plan creation for you – it’ll pull together the recipes, shopping lists, assembly instructions and meal prep instructions…JUST LIKE ALL THE OTHER MEAL PLANS we’ve shared in the past. Every time I try to click on the link, it says there is no domain there.